Bio S&T is the exclusive worldwide provider of pESAC13 PAC libraries. This unique vector (licensed exclusively to Bio S&T by NAICONS) is used to create Streptomyces sp. and Actinomycete sp. libraries. These libraries can then be screened for clones that will be positive for the desired gene clusters of biosynthetic pathways. This vector greatly facilitates antibiotic research. Latest article form NAICONS: Large inserts for big data: artificial chromosomes in the genomic era. ESAC (E. coli-Streptomyces Artificial Chromosome) vectors are bacterial artificial chromosomes that can be shuttled between Escherichia coli, where they replicate autonomously, and a suitable Streptomyces host, where they integrate site-specifically into the chromosome. pESAC13 is a derivative of pPAC-S1, one of the non-conjugative ESACs originally developed (Sosio et al., 2000). It was constructed by inserting a 760 bp DNA fragment containing oriT from the RK2 replicon (Simon et al., 1983) into the unique BstXI site of pPAC-S1 (M. Sosio et al., unpublished). 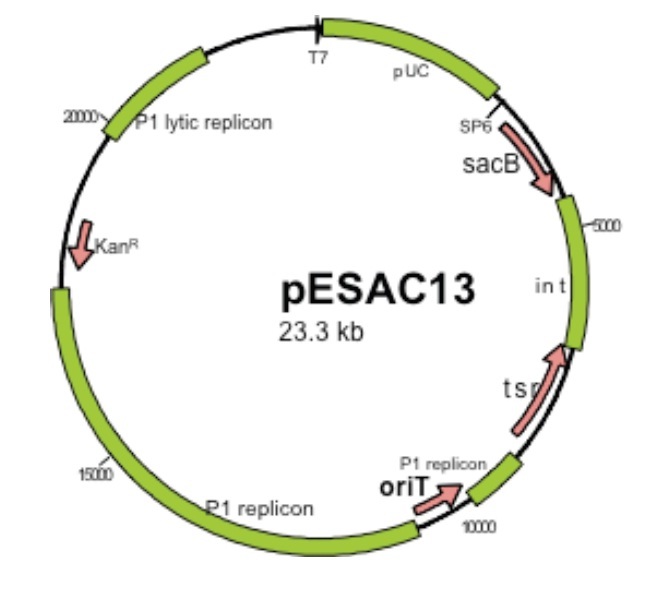 The important advantage of pESAC13 is that libraries can be conjugatively transferred from E. coli to a numberof Streptomyces species as well as into several non-streptomyces actinomycetes, without the need to purify large-insert clones and introduce them by protoplast mediated transformation or other means. HMW DNA isolation is included. pESAC-13 vector (BamHI) vector and DH10B cells will be used for construction. We guarantee a minimum 20X BAC library which provides a >99.99% probability of finding the target sequence. Amount of clones received is based on a guaranteed coverage and 120Kb average insert size. Clones will be arrayed and amplified in 5 x 384-well plates (1 unique clone/well). QC by HMW DNA enzymatic digestion are included. Quality control (average insert size and percentage of empty clones) will be evaluated using randomly selected clones. Customized screening for positive clones can be done at Bio S&T. High average insert and even insert size distribution. PAC libraries are the client's property and are never used internally, sold or distributed. Table 1: A few PAC libraries constructed in the past with obtained average insert sizes. Figure 2: PFG following DraI digestion of PAC clones (Actinomycete sp.) with an average insert size of 155Kb.